To purchase any of the books in this post, click the link above! Artificial Condition is the follow-up to Martha Wells' Hugo, Nebula, Alex, and Locus Award-winning, New York Times bestselling All Systems Red. It has a dark past - one in which a number of humans were killed. A past that caused it to christen itself “Murderbot”. But it has only vague memories of the massacre that spawned that title, and it wants to know more. Not my favorite of the series, Artificial Condition definitely feels like it was put together as a surprise follow up to All Systems Red. ASR finished on a very satisfying note and I feel that everyone was a little surprised by its popularity (question mark? Not sure why, because it's incredible) and decided to have Wells pick up the story and start running with it. This follow up felt a little jumbled and rushed, and came very quickly and a little underwhelmingly to the answer of why Murderbot calls itself Murderbot. 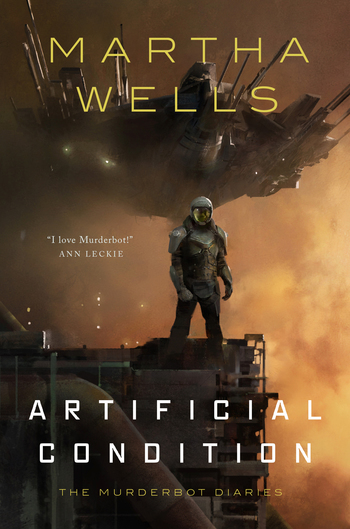 However, even what I feel was a mediocre Martha Wells story is still remarkably strong and still made me want to find out what happens next to Murderbot. A new mystery is on the horizon and Murderbot finds itself in a position that it didn't think it was going to be in: saving humans because it wants to and chooses to, not because it has been ordered to do so. It was remains hilariously cynical and exasperated by humans, while still discovering what it might actually mean to be human.